I’ve successfully trained many dogs to heel over the years. 4-H taught me a lot about dog obedience and behavior. Lessons that have helped me succeed with several dogs over the years. 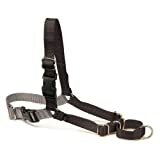 I’ve tried a couple harnesses and found only one style that I really like – a no pull harness like the PetSafe Easy Walk Dog Harness. I currently own two dogs, a rescued pit bull mix who is 4 years old and a Llasa Apso mix who is 1 year old. These two just would not cooperate with traditional training methods even with the help of Petsmart obedience classes. I heartily recommend obedience classes. They are an invaluable help. The pit bull we adopted when she was 1 year old. She hadn’t much obedience training and true to their nature she is extremely strong. I could not get her to heel, she would charge after passing dogs or just off to sniff whatever caught her attention. I tried squirting her with a water bottle when she started pulling which just made her pull away. Next I tried walking with a tennis racket in front of her nose when she pulled. That was extremely awkward and she didn’t understand anyway. So I bought her a head collar which helped a lot. It didn’t take her too long to get used to wearing it. I gave her lots of treats the first couple times putting it on. It was best to wait to put it on until right before leaving so she didn’t have time to scrape it off. The thrill of being outside distracted her within a block or two. We took an obedience class and the trainer didn’t like dog halters because if you don’t have it you don’t have control. So I tried standing still until she stopped pulling then continue forward. After several months of standing more than walking we gave up on this method. Just keep your halter in the same place and attached to the leash so you won’t lose it. Unfortunately, she started ignoring the head collar too. So I tried a choke chain with the head collar but that hurt me more than controlling her. The choke chain is a fine tool if used properly. It should be positioned high on the neck and only pulled on for short bursts – like a couple seconds at a time. Unfortunately, Bailey didn’t care about being choked only briefly. During this time I was seeing a physical therapist for back and hip pain. She asked me to stop walking the dog because she kept injuring me with her pulling. About this time I watched a Dog Whisperer where the owner was training her dog for water retrievals and used an electronic training collar for this purpose. Her dog was getting aggressive when people approached his kennel especially with his food. Cesar Milan showed her how to use the electronic training collar to change his behavior. This started me thinking about getting one for Bailey. It didn’t look like the dog was being hurt by it on the show. I also know Cesar wouldn’t abuse a dog. So I did more research on electronic training collars and decided to purchase one. I chose a collar with lots of flexibility for control. It has variable power settings that are super easy to change. The impulse can be as long as 8 seconds or just a nick depending on what you choose. It also has an option for a sound cue with no impulse. The electronic training collar is a last resort but one that has worked for me and Bailey. This is the one I chose PetSafe Yard & Park Remote Dog Trainer. Learning how to use it took several days of experimenting with how much energy to use and when. However it has really paid off. If she starts to pull I can just push the button and give her a little zap and she backs right down. When approaching dogs I just give her little taps to remind her to stay put. This has worked really well as long as I remember to start reminding her before she has crossed over the line and isn’t listening to me anymore. I can turn the power up but this seems to increase her agitation rather than calming her. So timing is critical with this method just like any other training method. We’ve used it for over a year now and it has been great. Very reliable and well made. Out on a walk these days I rarely need to use it for heeling but do need it to keep her from rushing at passing dogs. I found holding the remote in the same hand as the leash worked well for instant feedback when she pulled. Just wrap the lanyard around your wrist like a bracelet. Watch the training video closely and follow the directions. This isn’t a training method to go into blind. Please use this with caution. Now my llasa apso is also stubborn when it comes to heeling. Tripping over him would not make my physical therapist happy either! I tried a small Halti on him but it made his plugged tear ducts worse. In my Petsmart obedience class they taught click and treat when heeling. This worked great in Petsmart and somewhat at home. He just wasn’t catching on out on the street. We would walk briskly, click and treat at the perfect moment then he would charge ahead joyfully with his treat! To counter this I clicked, treated and kept moving all in one motion but he still charged ahead. Completely clueless about why he got the treat. I’ll probably try one for Bailey too, eventually. Check back for product updates – I love experimenting! Finally we are walking and injury free! I hope my experience can help you achieve the same results.